Aloha: Hawaiian hospitality. 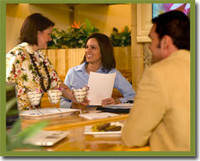 At Hawaiian Hut, we serve customers with the inviting warmth of the islands. Wiki: Quick, fast. We are a fast-casual restaurant. We don't want our customers' experience to be the wait, we want it to be the food on their plate. Ono: Delicious, tasty, savory. We pride ourselves in authentic, refreshing, creatively delicious local Hawaiian cuisine. Hawaiian Hut delivers an unparalleled tropical twist in meeting the growing demand for gourmet cuisine in a fast-casual setting! Hawaiian Hut's striking ambiance welcomes guests with the alluring aroma of exquisite local Hawaiian cuisine, soothing island melodies, exhilarating island attractions, and the "aloha spirit" of the islands. Customers enjoy their meal in a thatched hut or under a bamboo umbrella in paradise. As taught by his Tutu, there, in good "old Hawaii," my father mastered the traditional ways of Hawaiian cooking. Tutu has long since passed on, but the traditional cooking styles have remained a part of my father, and our family heritage. Featuring our family's traditional recipes and local island flavors with a contemporary spin - My wife and I are pleased to bring authentic Hawaii to you! Become a member of the Hawaiian Hut Ohana (family). E Komo Mai- We welcome you to learn how you can own a piece of paradise and bring Hawaiian Hut to your area! Please note this franchise is currently not accepting inquiries from or from outside the United States. Interested parties should have at least $100,000 to invest.